The world would be a poorer place if it were not for the Czech composer Leoš Janáček’s gorgeous ‘Pohádka’. It was originally written in the early part of 1910 being completed on 10 February of that year. It was subject to a number of revisions over a period of 13 years. The version that Naomi Wright plays was published in 1924. Janáček had strong leanings towards Russian culture: he was competent in the language; he chaired the Russian Circle in Brno (1897-1915) and had a deep interest in the literature of that country, especially Tolstoy, Gogol, Lermontov and Dostoevsky. It was under the spell of Vasily Zhukovsky’s (1783-1852) Russian stories concerning The Life and Times of Tsar Berendyey that he conceived his ‘Tale’ for cello and piano. The word Pohádka corresponds to the English phrase ‘Fairy Tale’. Whatever the details of the story - and to a certain extent this is ‘programme music without a programme’, Janáček weaves a magical spell. The music is typically misty - the use of lots of flats - and is often a dialogue between soloists. The clever part of ‘Pohádka’ is the constant balance between ‘delicate lyrical’ and ‘swift dramatic’ moods of playing: it creates its own special enchantment. The form of the work hovers somewhere between sonata and rondo. Naomi Wright is correct in calling it a ‘sonata fantasy’. There are many recordings of this piece available (31 listed at Arkiv) with big names such as Stephen Isserlis/Thomas Ades and Mstislav Rostropovich/Benjamin Britten leading the field. Wright and Lawson give a superb performance, which is suitably atmospheric and deals well with the various technical and interpretative issues that the work presents. 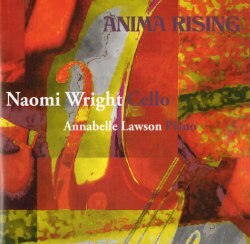 Naomi Wright has composed an interesting work for solo cello called Trust. It consists of three pieces with extremely diverse sources of inspiration. The opening ‘Frida’ seemingly reflects the Mexican artist Frida Kahlo, which is also the name of the composer’s motor car. This is sultry music that takes its lead from the tango world of Astor Piazzolla. The mood appears to portray the end of a long day after the Fiesta has finished. The second piece is ‘Pune’ which was inspired by Wright’s visit to India. It is a touch ‘Bollywood’ in places. The final number is dedicated to Joni Mitchell, singer, songwriter, political activist and painter. For people of a certain age she will always be remembered for her first major hit ‘Big Yellow Taxi’ however over the years she has explored a wide-range of musical styles including jazz and electronic music. For my taste, Trust is just a little too diverse and lacks a sense of unity. Each piece is well-written and has considerable musical interest. John Hearne’s ‘Ljod’ (1985) is the most challenging piece here. The composer writes that the work was composed as an entry into a ‘guestbook’ commemoration of a reunion of a number of friends after many years of separation. I guess the reason for the music’s darker moods is the obvious fact that no-one at that get-together knew whether and if so when they would meet again. The word ‘Ljod’ translates as ‘poem’ or ‘poetry’. Hearne is being extremely modest when he refers to his composition as being a ‘little piece’. The music reflects the chilly atmosphere of Iceland’s topography and the warmth of the people whom the composer met there. The style is approachable but is coloured by an inevitable darkness and introspection. There are some fraught passages; however the conclusion is much more positive. This is a fine work that deserves to be heard apart from its genesis as an occasional piece. There are no details about the composer’s life and works given, but he does have an excellent webpage. He is indeed a prolific composer. I have not heard any music by Stephen Plews before. Unfortunately once again the liner-notes tell us nothing about him. His website notes that he was born in Salford in 1961 and has enjoyed a career balancing his love of classical music and jazz. Composers that have especially interested him are Ravel, Debussy and Stravinsky. There are two works by Plews on this CD: the short ‘Preludes 1-3’ and ‘Trois conte des fées urbain’. The ‘Preludes’ are minuscule, lasting for a total of just 1 minute 47 seconds. This is almost ‘Webernesque’ in its conciseness. They are approachable and create an attractive sound-scape: alas, they are not long enough to get to grips with. The ‘Trois Conte[s]’ seem to owe something to Ravel in their title at least. The three movements depict some imaginary story which the composer does not choose to reveal. All he says is that it reflects an urban fairytale/nightmare. Plews has used a fairly traditional musical language, but has incorporated electronic music into the mix. The three short movements are ‘Pavane’, ‘Fantôme d’un fée’ and ‘Une contemplation’. Finally, although my French is not brilliant, should the title be ‘Trois Contes’ as opposed to ‘Trois Conte’? The main event on this CD is the Beethoven Cello Sonata No.2 in G minor, Op.5. There are five examples of this genre in Beethoven’s catalogue plus three sets of variations on themes by Handel and Mozart. The sonatas were composed throughout the composer’s life between 1796 and 1815. The first two come from the ‘early period’, the third from the ‘middle’ and the last two from the final (post 1815) chapter. Most commentators would suggest that during his ‘early’ period he was influenced by Haydn and Mozart. Beethoven was not content merely to imitate, but pushed the boundaries beyond what those masters had achieved. From this period come the first two piano concertos and two symphonies, the first dozen piano sonata and the Op. 16 string quartets. The present Cello Sonata, along with the F major, was composed during a visit the composer made to Berlin in 1796. They were dedicated to Jean-Pierre Duport who was the first violoncellist to King Frederick William II of Prussia. It is interesting to note that the king was an accomplished cellist, and it is likely that Beethoven was at pains to impress him with an interesting and independent cello part. It is a feature of this work that the composer moves away from the ‘old’ concept of a piano sonata with instrumental accompaniment to that of a genuine duo sonata where players had a much more equal partnership. Beethoven chose to exploit the instrumental possibilities of the cello and included a wide range of technical effects including pizzicato, double-stops and chords. He explored the instrument’s ‘declamatory and rhetorical abilities’ as well as the use of cantabile melody. The entire register of the instrument was used. The Cello Sonata No.2 is written in two movements: an adagio-allegro followed by a rondo. The dramatic content of the first movement is reinforced by the long adagio introduction which constantly hints at the stormy allegro that is to follow. The rondo is much more relaxed in its mood. Naomi Wright and Annabelle Lawson have given an excellent account of this work. The balance between the cello and the piano is ideal and the technical difficulties are handled with aplomb. There are a number of issues with the presentation of this CD. Firstly, like so many productions these days, the artistic element of the cover and liner-notes design trumps its utility. Tiny yellow (?) text on a purple background is not easy to read. I felt that these notes could have included a little more detail, especially about the contemporary works. There is no reference here as to when any of this music was written although the notes do mention the date of printing of the Beethoven. I understand that typically this information is available on-line, but this is an assumption that cannot always be made. We are not given any biographical details of the performers or the composers. The various recording dates and locations are not tied into the actual compositions. There is the spelling error alluded to above. Also there is a typo in the track listings - movement 3 of the Janáček is shown as being on track 5 not 3. I presume that the Trust that supported this work is the Kenneth Leighton Trust? I would have put the pianist Annabelle Lawson in the same size font on the cover as Naomi Wright as both the Janáček and the Beethoven are true partnerships. Finally, I understand anybody’s desire to keep their date of birth under wraps, but as the composer of ‘Frida’ I feel that Naomi Wright ought to have entered hers in the liner-notes. None of the other composers are given dates either - but they were easily located online. All this will no doubt be deemed nit-picking, yet it seems a pity to have produced a fantastically well-planned programme, to have executed the works with considerable technical and musical ability, to have delivered a first class sound recording but not given attention to detail. These are often important to listeners as it can help them situate the works in their musical and historical contexts. It is certainly essential for the record reviewer to have all this information to hand. Excellent playing and an imaginative programme.